Looking for gift ideas for the man in your life? Get the PERSONALIZED "To The Best Husband in the World" Hardcover Journal, featuring his name on the cover. You may choose to customize the cover with your name and favorite color. Simply leave a note at check out with the name you would like on your journal cover. A beautifully personalized hard cover journal for husbands that features his name on the cover makes writing a whole lot more fun! He can write down his thoughts, plans, lists with a hard-cover personalized journal notebook with his name on the cover. 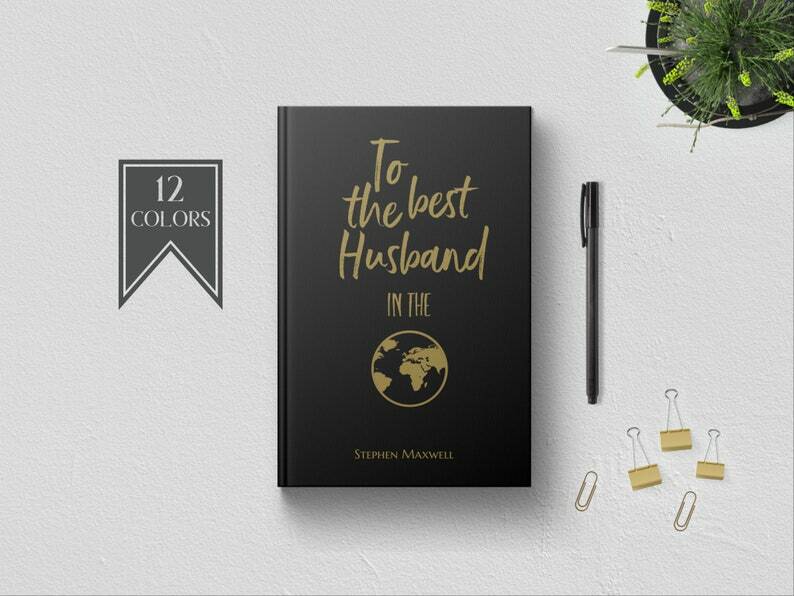 This "To The Best Husband in the World" journal book will become his constant companion and a prized possession that enriches his life and sparks his creativity. Personalized with his name, this hardcover journal becomes more than just a blank book - it becomes an extension of him, a tool to help capture the thoughts and moments that make up his days. Use the Personalized "To The Best Husband in the World" Writing Journal Notebook to record all of those dreams, feelings, creative ideas, or for everyday note-taking. This blank lined journal notebook makes the perfect, one-of-a-kind birthday gift, Christmas gift, wedding gift, paper anniversary gift, or Father's Day keepsake gift the man in your life will love and remember. * Choose from Lined, Dot Grid, Checklist, or Blank pages in the interior. • Features a custom name on the gorgeously designed cover. Or You can select a custom color of your choice. In the NOTES AREA at check out include NAME you would like for the cover. Every journal is made to order and our production time is 4 to 6 BUSINESS DAYS. However, we do try to ship earlier whenever possible. Processing times can be longer during the holidays. Orders are processed as they come in. We do not offer rush printing. Personalized Hardcover Writing Journal for Men. Custom Name. Cute Gift for Him. Husband Boyfriend Uncle Brother Boss Father Coworker Pastor. To Best Wife in World Personalized Custom Name Journal Book. Birthday Anniversary Romantic Gift Ideas for Her. Love Letters from Husband. Personalized Writing Journal. Custom Name Hardcover. Lined Dot Grid. Cute Gift for Her - Mom Wife Sister Daughter Best Friend Boss Teacher. PERSONALIZED You Are Braver Than You Believe Writing Journal. Custom Name. Gold Hardcover. Graduates Teens Daughter Sister Best Friend Gift. Personalized Happily Ever After Journal. Custom Couples Wedding Engagement Bridal Shower Gift. Getting Engaged. Romantic Love Words Quote. Dad the Man Myth Legend Custom Journal Book. Personalized Journal Notebook. Birthday - Fathers Day Gift. Lined. Dot Grid. Blank. Hardcover.